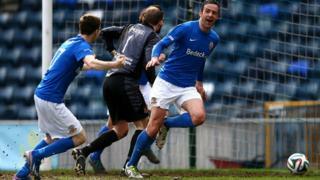 Glenavon are into their first Irish Cup final since 1998 after beating Crusaders 3-1 after extra-time at Windsor Park. Ciaran Martyn scored twice and Mark Patton shot in the other for the Lurgan men with Paul Heatley on target for the Crues. Glenavon's Tiarnan Mulvenna and Chris Morrow of Crusaders saw penalties saved.